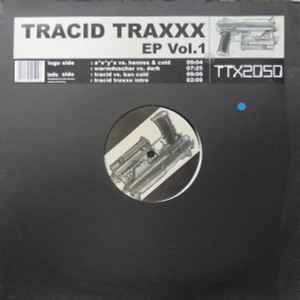 A Tracid Traxxx Allstars EP. 3 great typical tracid traxx high quality productions. Tracid vs. Kan Cold - truly masterpiece!one of the best hard trance melody,reminds me "Transmission" but much more better!! For me, this is an excellent representation of the Tracid Traxxx sound, and a demonstration of what these legendary TTX producers can do. A*S*Y*S vs Hennes & Cold definitely mixes the styles of the two artists well. The intro has a very A*S*Y*S feel, using little bits of acid and percussion reminiscent of many of his other tracks. The main melody is in the vein of many other H&C melodies, however it uses a very typical A*S*Y*S sounding synth, a great combination. Warmduscher vs Derb also blends the influences of both artists well, with the use of a nice grinding Warmduscher bassline in concert with the typical Derb sounds that can be found in many Derb tracks. The outro contains some acid which is reminiscent of many Warmduscher tracks such as 10 Kleine Bassdrums. This track is slightly more downtempo and laid back than the A*S*Y*S & Hennes & Cold track, but is still an excellent example of Derb/Warmduscher style hard trance. For me, the Tracid vs Kan Cold track is the highlight of the three. The intro builds up nicely to a short breakdown and then the bassline comes in, a huge kick with definite Kan Cold-style reverse after it, and some nice high hats and synth to punctuate it. In the midintro a short melody comes in, then the amazingly atmospheric main break comes, leading into the main melody. Kan Cold's melodies are often some of the finest in hard trance, and I think the melody in this track is probably one of the best I've ever heard. Truly I think its arrangement is a masterpiece, every time I hear it a smile comes to my face. Overall this record is a great representation of what Tracid Traxxx is (or was). Any die hard TTX fan should own this record. "A*S*Y*S vs. Hennes & Cold" is a pumping hardtrance track containing a very long, minimalistic lead in. The sudden break introduces the epic main theme, that dominates the track. After this melody has rocked the club the acid line fades in. Within one minute of pure acid ecstasy the 303 and the main melody form a furious final. The best track of the whole EP in my opinion. "Warmduscher vs. Derb" is the perfect fusion of rough Derb sounds with headcrushing acid. The bass is a bit weak, but this is compensated by one of the best acid line I ever heard. All in all a very nice vinyl that gives you an impression what Tracid Traxxx is.